Valve has decided to remove cross-platform play from Counter-strike: Global Offensive in favor of more frequent updates. One of the more interesting features of Valve's upcoming update of classic online-shooter-turned-insult-festival Counter-Strike, was that the game would allow players to compete against each other regardless of their chosen platform. Assuming their chosen platform wasn't the 360. But apparently Valve has chosen to remove the feature, meaning PC/console gamers looking to show those filthy console-peons who's boss/take those smug PC gamers down a notch will have to stick to calling each other names on internet forums. "The beta has proved we want to update not just the beta, but the game itself post-launch frequently on the PC," Valve's Chet Faliszek told Joystiq. "To do that we need to separate the platforms so one doesn't hamstring the other. So for that, we have removed the idea of cross-platform play -- essentially make all platforms stronger by not mixing them." 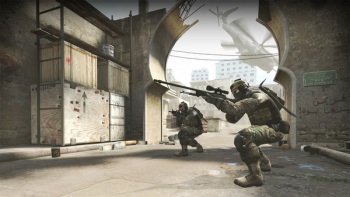 While Valve controls the distribution platform for the PC version of Counter-strike: Global Offensive, and can therefore churn out game updates whenever it feels like it, updates for the PS3 version of the game would have to be vetted by Sony. Valve ran into similar problems with the multi-platform release of Team Fortress 2. While PC gamers got access to all kinds of free content on a semi-regular basis, console gamers got absolutely zip, apparently due to the restrictions Microsoft places on XBOX live content.